Native to Tanzania,Africa and Introduced to most Tropical and Subtropical countries . Long Term pasture if fertility maintained.Ideal for Cut-and-Carry,although bristly types may cause discomfort to forage collector.Suited to agroforestry due to shade tolerance.Reasonably palatable when mature,providing good roughage for use in conjunction with Urea molasses licks.Has been used successfully for making silage and hay. ·Very leafy. ·High quality feed. ·High production potential. ·Early season growth in some lines. 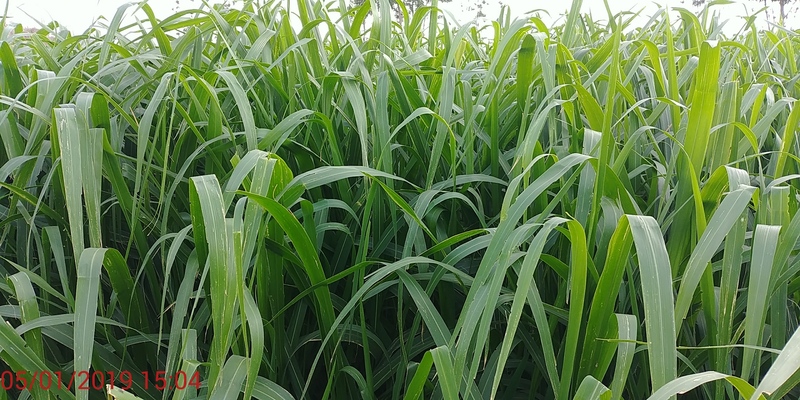 Tall garss and similar to hybrid Napier(Elephant)Grass in habit,but far more leafy and is very suitable for Cut-and-Carry.20~40 Ton/Ha dry matter per year. 8~12% on poor soils and 12~14% on better soils. Can be either rotationally grazed or set stocked.Most farmers in South America prefer Cut-And-Carry.Therefore cut every 40~45 days in the wet season and 60~70days in cool season. Can be either planted in rows,50cm apart,or broadcast sown at 6~8kg/Ha.Sow the seed on to the soil surface,brush the seed with soil by using tree branches or large brooms.Bury the seed no more than 1~2cm under the soil.It is easy to plant from rooted tillers. It was introduced into Brazil from Tanzania in 1993,from near Korogwe,Tanzania.Large tussocks to 2m ,stem tinged with purple.Leaves are long,to 3cm wide,with short hairs on the upper surface,leaf sheaths are glabrous.Good drought and cold tolerance.Dry matter yield 28% more than that of Guinea TG58. Seeds produced in Thailand is harvested by hand and has a purity of over 98%.It is totally pure with no other Guinea grass seeds in Mombasa seeds from Thailand.